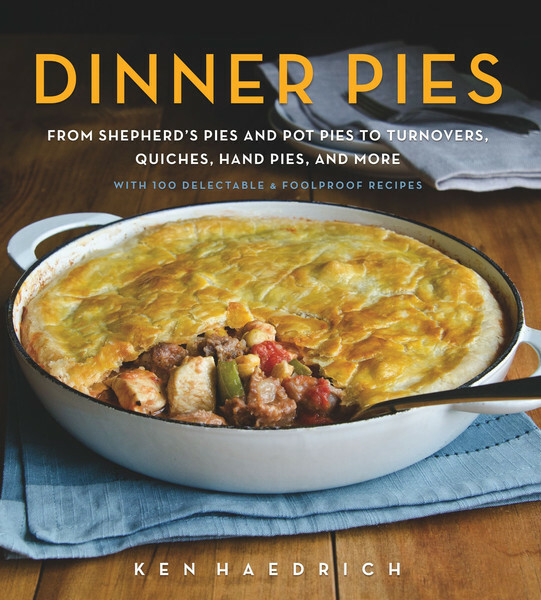 Several months ago, you may recall, I mentioned that in the not-too-distant future you could expect to start finding savory pies here on the pages of The Pie Academy. 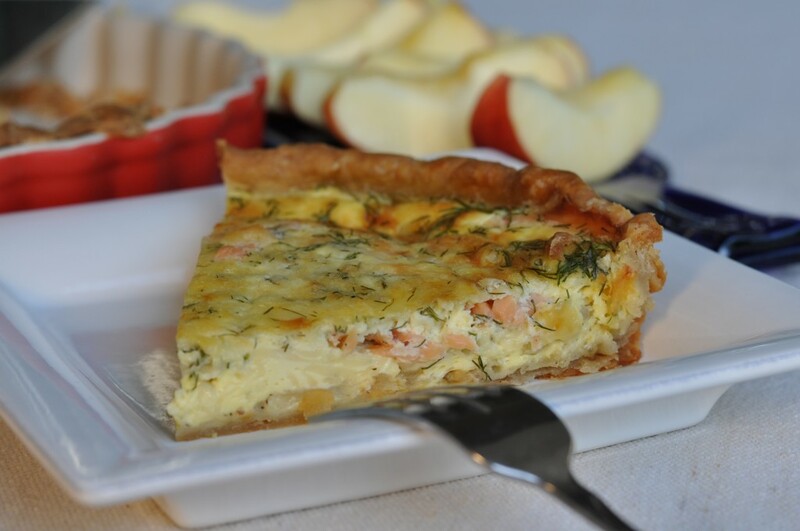 That future has arrived with this recipe for one of my favorite savory pies: Savory Smoked Salmon, Dill and Gouda Pie. 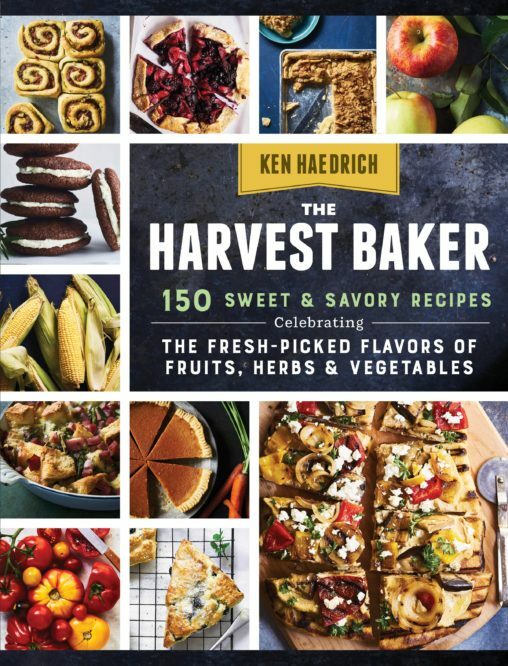 Adding savory pies to the mix is a recognition on my part that not everyone likes sweet pies, a limiting factor for someone like myself who hopes to engage the widest possible cooking audience. 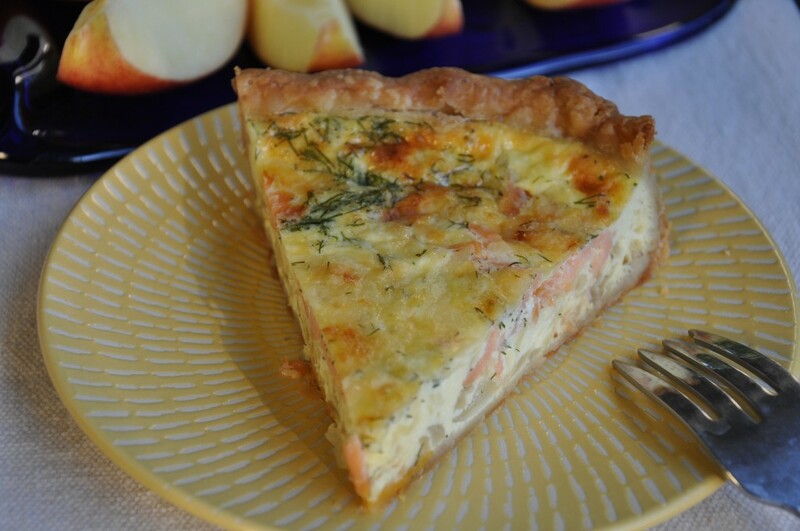 It’s also a natural extension of my belief that almost anything – in this case eggs, salmon, Gouda and dill – tastes better when it’s encased in a flaky crust. Watch for many more savory dishes to come, as The Pie Academy opens its doors to pot pies, meat pies, quiche large and small, empanadas, turnovers and other hand pies. 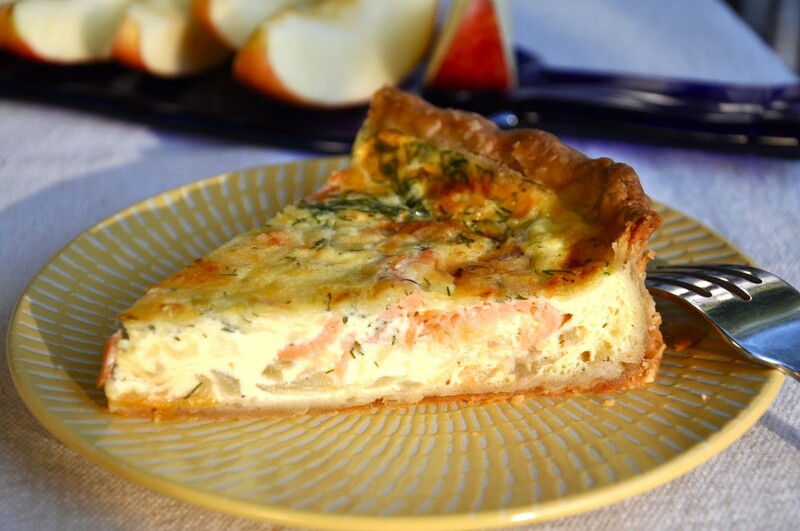 This is week 7 in our parade of tailgate pies so it would be fair to ask just how our smoked salmon pie (or quiche) fits the profile of a tailgate pie. To which I would reply: quite nicely, thank you. 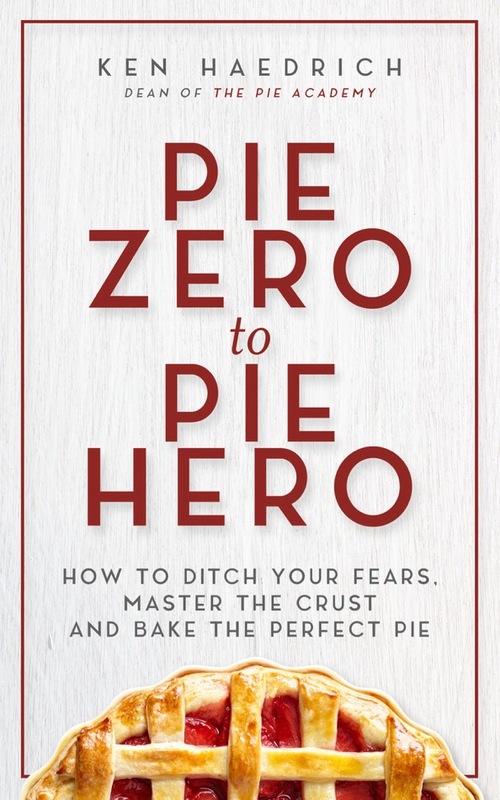 A savory pie – cut into thin slices and served at room temperature (or ambient stadium temperature, as the case may be) – is an excellent way to take the edge off appetites mercilessly sharpened by the first whiffs of smoldering meats. In other words, perfect for tailgaters who start early in the day and serve breakfast or brunch as a prelude to the main event. The beauty of our Good Basic Pie Dough is that it works as well for savory pies as it does sweet, so we’ll use it again here and prebake it to keep the bottom of our pie suitably crisp and crusty. Prebaking involves an extra step, but it’s one worth taking: a limp or otherwise soggy bottom crust is a pie felony that no jury will show much mercy for. PASTRY NOTE – Use any favorite pastry you like for the pie shell, but my first choice is the GOOD BASIC PIE DOUGH. For best results, be sure to partially prebake the shell – as directed – before filling. On a sheet of lightly floured wax paper, roll the pastry into a 13" circle. Invert the pastry over a 10" quiche pan or 9 1/2" deep-dish pie pan, center, and peel off the paper. Gently tuck the pastry into the pan, without stretching it, then pinch the edge into an upstanding rim. Place in the freezer for 15 minutes while you preheat the oven to 400°. Tear off a 16" long sheet of aluminum foil and press it into the firmed shell so it fits like a glove. To prevent the pie shell from puffing as it bakes, fill the foil about 3/4 full with dried beans, banking them up the sides. To make the filling, heat the butter in a large skillet. Add the onion and saute over moderate heat for about 8 minutes, until clear and light golden in color. Remove from the heat. Whisk the eggs in a large bowl. Whisk in the light cream, dill, mustard, salt, and pepper. To assemble the pie, spoon the onions over the crust, spreading them evenly. Sprinkle with half of the cheese, then top with pieces of the smoked salmon. Carefully pour or ladle the custard over the filling. Sprinkle with the remaining cheese. 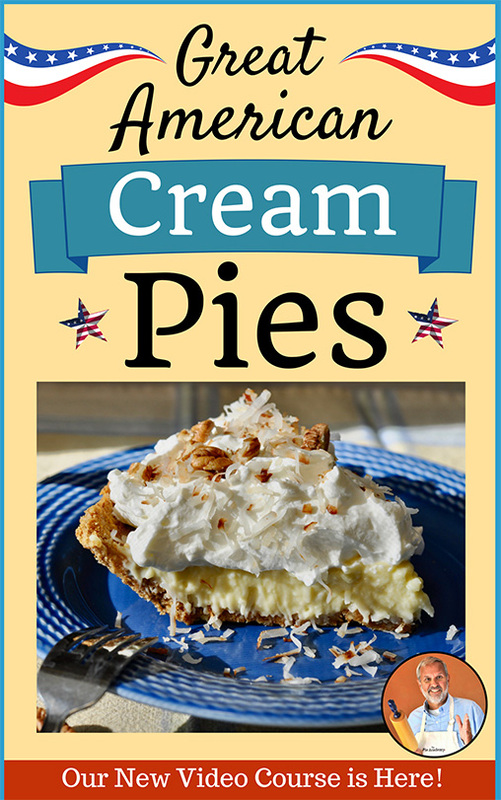 Bake the pie on the center oven rack for about 35 to 40 minutes, until the filling is set and the top is golden brown. Cool on a rack. Serve warm, coolish, or at room temperature. Makes 8 to 10 servings.